Matt Jansen’s Magpies climbed into second place in the National League North after finally taming the Tigers. It was the first time in five meetings that Gloucester had tasted defeat against Chorley and comprehensive though it was in the end, the scoreline does not reflect the hard work put in by a fast-moving City side understandably among the play-offs chasers themselves. But Chorley were once again in no mood to let their own promotion bandwagon stall. In what is proving a quite remarkable season, the ultra-consistent Magpies are where they are strictly on merit. The visitors’ cause was not helped by the loss through injury in the opening minutes of long-serving skipper Tom Webb. But despite suffering two hammer blows in the first half they never gave up, though significantly in the final analysis they failed to seriously test home keeper Shaun Rowley. Adam Roscoe in the Chorley engine-room repeatedly disrupted City’s forays from midfield, while Scott Leather and Steven Jordan were commanding centre- backs. Jake Cottrell, industrious as ever, gave Chorley a massive boost on 19 minutes, firing a thunderous shot from almost thirty yards into the roof of the net. The home side’s lead was doubled on 36 minutes after an error by City keeper Jasbir Singh, who failed to gather a through-ball and lost his footing too, leaving Marcus Carver to apply a simple finish into the empty net. Rowley darted from goal to deny Luke Hopper soon after the interval before Gloucester were fortunate to escape a penalty-award when Carver was hauled down. But the Tigers’ resilience was rewarded in the 69th minute, Danny Greenslade’s well-flighted free-kick enabling Hopper to glance the ball past Rowley from short range. It looked as if a close finish was now on the cards but the Magpies had other ideas and ended the match with a two-goal flourish. 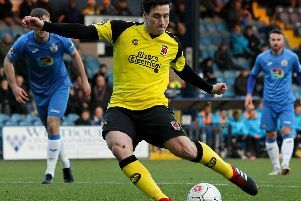 Substitute Alex Samizadeh – described by Jansen afterwards as ‘a pocket-rocket’ – again marked his introduction to the fray with a goal within minutes. The young striker broke through and beat the advancing Singh with a low shot in the 82nd minute. And the icing was put on the Chorley cake three minutes later. A soft penalty was awarded as Jason Walker was eased off the ball and he picked himself up to score confidently from the spot. CHORLEY: Rowley, Challoner, Blakeman (Beesley 87), Sheron, Leather, Jordan, Roscoe, O’Keefe, Carver (Samizedeh 77), Walker (Azam 89), Cottrell. Subs (not used): Jarvis, Cowan.